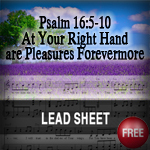 Scripture Songs for Worship : Psalm 16:5-11 "At Your Right Hand are Pleasures Forevermore"
Psalm 16:5-11 "At Your Right Hand are Pleasures Forevermore"
5 O Lord, You are the portion of my inheritance and my cup; You maintain my lot. 6 The lines have fallen to me in pleasant places; Yes, I have a good inheritance. 7 I will bless the Lord who has given me counsel; My heart also instructs me in the night seasons. 8 I have set the Lord always before me; Because He is at my right hand I shall not be moved. 9 Therefore my heart is glad, and my glory rejoices; My flesh also will rest in hope. 10 For You will not leave my soul in Sheol, Nor will You allow Your Holy One to see corruption. God gives you such beautiful melodies. I am also happy that you use your voice powerfully, because i know it is easy to sing timidly and even let the computer make a voice sound strong - but it is obvious you are mightily praising our Lord. God is with your family. We will be in His city soon.